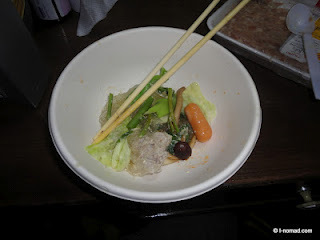 Hotpot is a beloved dish in Thailand, China and the rest of S-E Asia. Basically it’s a bouillon brew in which one can cook almost anything. Since we usually eat out, it is a real ‘luxery’ to cook indoors. 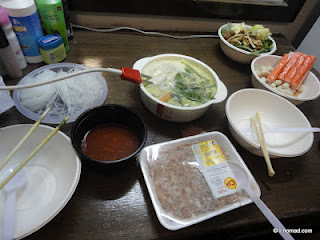 Hence our efforts to see if it would be possible to enjoy hotpot in the confort of our own room. Traditional hotpots are made in a clay pot on a charcoal fire, so we we had to make some consessions without affecting taste. 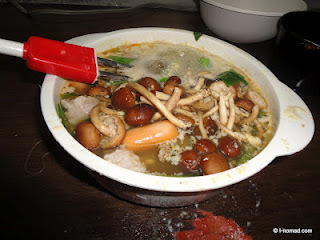 Below is our recipe for hotel hotpot ‘du chambre’ for two persons. - A knife and/or siccors. Fill the bowl for 2/3 with water. Bring it to boiling point with the immersion heater. but it’s no problem to get your veggies and meat well done, just wait a bit longer than usual. Clean and cut part of the vegetables and add them to the brew. Add one of the eggs. Make some meat balls with a spoon and add it to the brew. Add whatever you have left..
Dip in chilli paste or sauce and you’re ready to enjoy. As mentioned above; mixing eggs into the brew will need a bit more effort to clean the spiral shaped heating element. 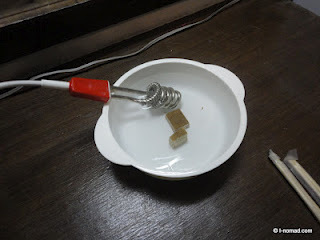 - Let the heater element soak in cold or warm water for half an hour or so. - Apply a small brush such as your old toothbrush to clean. - If it’s still not clean, repeat from step 1. 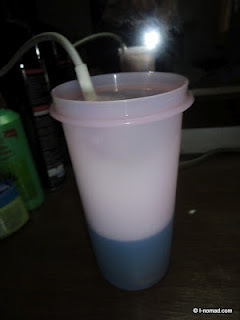 - Cook any remaining stains out in tap water. 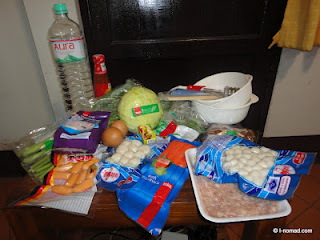 Final remark: Since the food was packed in quantities far too much for two people, we did have enough left to make two hotpots more, also we had to buy some additional kitchen gear like chopsticks (a pack of 50pcs! 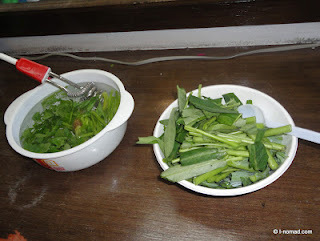 ), a micro wave oven proof bowl, plastic spoons (25 pcs) and carton bowls (10 pcs). This added up to ฿750 (€18.70 / $24.40). A similar dish at the food court in Chiang Rai’s night bazaar would have cost us just ฿150 (€3.75 / $4.90). So in fact we paid five times more. Mind you, this was our private dinner indoors, so we felt entitled to spend a bit more. If we would have gone to the market, we could probably have bought most things in smaller quantities reducing costs. We are planning to cook something unknown tomorrow from the leftovers in order to make our attempt look more worthwhile or actually… less silly.